There was quite a bit of leftover "filling" and it actually made for a really good raw dip or spread to use on sandwiches! I will most definitely be making it again. 8 oz (about 20) baby bella mushrooms. 1/2 tbs coconut oil (you could use olive oil if making a raw spread). Preheat oven to 400 degrees. In a food processor or blender, combine all ingredients except mushrooms and balsamic vinegar and blend until smooth. Wash mushrooms, carefully remove stems to create a pocket for the filling, and brush with balsamic vinegar. Evenly fill mushrooms with spinach and walnut stuffing. Place stuffed mushrooms on a baking sheet and bake for about 15 minutes, or until mushrooms have softened and released their moisture. 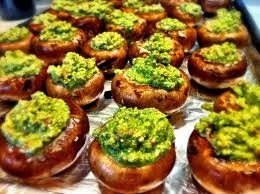 Remove from oven, carefully use tongs or a spatula to transfer mushrooms to serving dish.